Posted 31 July 2018. PMN Crop News. Ames, Iowa (July 3, 2018)--While off-target dicamba injury to soybean has dominated the news the past year, it is important to recognize that dicamba is not the only Group 4 herbicide (HG4) capable of injuring soybean. These herbicides mimic the activity of indole acetic acid (IAA), a hormone that regulates the activity of numerous genes involved in plant growth. IAA also is referred to as auxin. HG4 products can induce plant responses at lower doses than most other herbicide groups, thus off-target injury has been a problem since their introduction in the 1940�s. This article will discuss some of the problems observed this growing season. All HG4 cause malformed leaves, and distinguishing symptoms between products is difficult (Figure 1). Timing of symptom development and patterns of injury are important in identifying the source of injury. Figure 1. Typical dicamba symptoms on soybean. Clopyralid is sold individually as Stinger, but in corn is more commonly used in the premixes Hornet and SureStart. While clopyralid has a much longer half-life than 2,4-D and dicamba, the rates used in corn typically do not carryover at toxic concentrations into the following season. However, many areas of the state were rain deficient during the 2017 growing season, leading to increased persistence. When clopyralid residues are responsible for damage to soybean, symptoms typically appear by the V1 stage (first trifoliate). Damage is usually associated with soil type or in streaks related to spray overlaps, rather than field wide injury. HG4 are commonly used in pastures and hay fields for broadleaf control. Grazon P+D and GrazonNext are popular products that contain picloram and aminopyralid, respectively. Like clopyralid, these two herbicides are relatively persistent. These herbicides can persist at phytotoxic concentrations in the soil, in forage harvested from treated fields, and in manure of animals consuming forage. Problems may develop when bales of hay from treated fields are placed or spread in fields to be planted to soybean (Figure 2). Concentrations can be high enough to severely damage, or even kill, emerging soybean. Several instances of this type of injury have been observed this year. Figure 2. HG4 injury from spreading hay from field treated with picloram on field planted to soybean. Undoubtedly, movement of HG4 from treated areas is the most common source of off-target injury. Off-target injury from use of dicamba in Xtend soybean was a significant problem in Iowa in 2017. Last year we estimated that 150,000 acres of soybean in Iowa were damaged. However, it is important to recognize that HG4 are used in other areas than soybean. 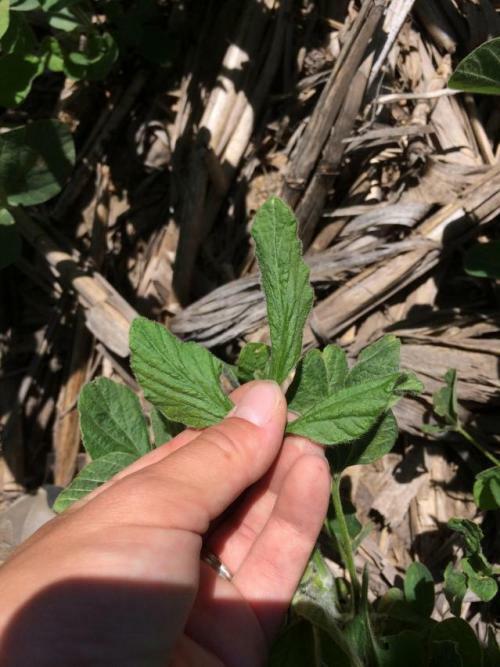 We are aware of numerous situations this season of dicamba used in corn damaging adjacent soybean, and each year HG4 use in roadsides results in damage to sensitive plants. Dicamba use in Xtend soybean poses a greater risk than when used in corn since it is applied later in the season. 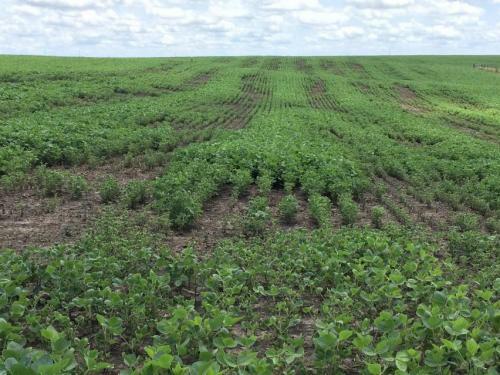 Numerous label changes and required training for applicators using dicamba on soybean should help reduce the frequency of off-target damage, but it is too early in the season to determine the impact of these changes. In 2017, reports of dicamba injury in soybean did not begin until after July 4 in north central Iowa. Numerous reports of injury have been reported in 2018, at this time mostly in southern Iowa. The widespread occurrence of herbicide resistant weeds has resulted in an increase in both the quantity and frequency of herbicide applications in soybean. This increases the likelihood of adverse crop responses � sometimes dicamba gets blamed for damage that it isn�t responsible for, and sometimes dicamba injury is blamed on other factors. 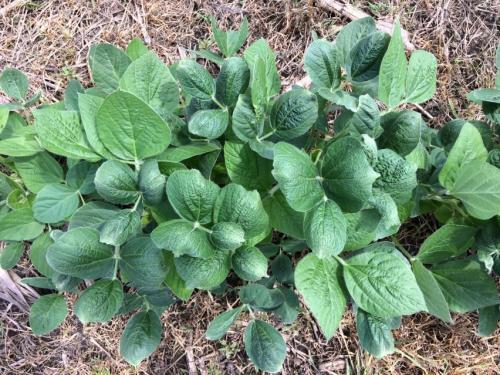 The distinct symptom of dicamba is cupping of leaves that emerge after exposure; this injury is typically not noticed for 7-14 days after application due to the time it takes for new leaves to emerge following exposure. The number of leaves affected is determined by the rate of exposure. All HG4 cause distorted leaf growth, but there can be differences in the type of leaf malformations caused by different herbicides. Frequently 2,4-D results in elongated, strapped leaves in contrast to the cupping normally observed with dicamba (Figure 3). However, dicamba-type cupping occasionally may be caused by other HG4, and elongated leaflets may develop following dicamba exposure. Thus, it is always critical to identify the source of problem rather than assigning blame based solely on the symptomology observed. Figure 3. Elongated leaflet associated with preplant 2,4-D application with sprayer malfunction resulting in excessive rate. There has been discussion that AMS used with Liberty and other postemergence products may be the source of leaf cupping. AMS has a long history of use as a spray additive, and leaf cupping is not a plant response associated with AMS. The use of group 15 herbicides (Dual, Warrant, Zidua, etc.) has greatly increased in soybean to improve waterhemp control. 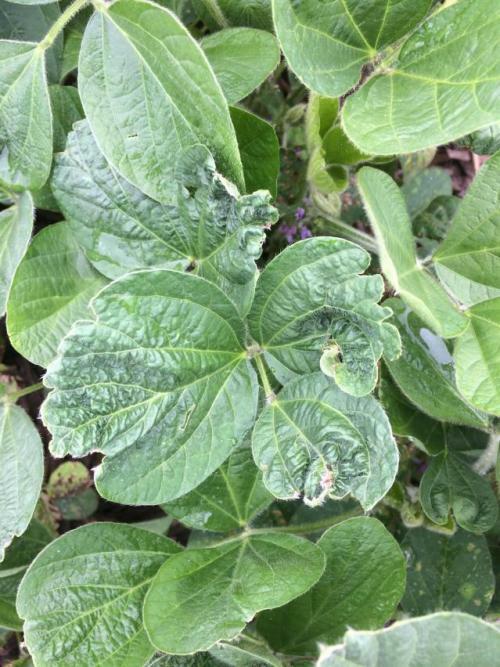 These herbicides may cause abnormal development of leaves, but the symptoms do not involve the veinal distortion typical of dicamba or other HG4. The classic symptom of preemergence applications of HG15 is shortening of the midrib on leaflets, resulting in heart-shaped leaflets. Post applications can also cause this symptomology, or they can cause other distortion of leaflets, resulting in irregular margins of leaflets (Figure 4). Sometimes, distortion of developing leaves can happen with POST applications of the HG14 contact products as well. This distortion is generally accompanied by some contact burn. Figure 4. Leaf malformations following postemergence application of HG 15 product. Note lack of symmetry in symptoms on leaflets. Group 4 herbicides are important tools for managing weeds in a variety of situations. While effective tools, their ability to induce plant responses at fractions of label rates requires a higher level of management than other herbicides. When symptoms of HG4 appear it is important to identify the source of the herbicide, and take steps to avoid repeat occurrences in the future. Find the most current information related to crops, soils, nutrient management, water quality, grain quality issues available at Integrated Crop Management. Subscribe to ICM News articles and ICM Blog to receive notification when new articles are published at http://crops.extension.iastate.edu/cropnews.